A Reality Check on Grades...Are You Affordable? ...or call us at 719-203-4565 to learn more. They have the expertise within their sport to evaluate a prospect' potential to compete at the collegiate level. Seminars offer the opportunity for you to be introduced to several industry experts in a short amount of time—typically over a 2-3 day period—and most importantly allow you to network with others. Our Success Rates are Impeccable. Finding Rick and ACC was an absolute Godsend! "We went through the recruiting process by ourselves with our first daughter and used American College Connection with our second. We were not able to secure a scholarship with our first swimmer, but ACC helped our second swimmer get most of her education paid for. We are living proof that ACC is a great investment and I am reminded of that every time I write the tuition check for daughter #1." "It seems like these guys know every college coach in the country. Their connections are what make ACC special. They are the experts when it comes to collegiate athletics and they offer a huge recruiting advantage for anyone utilizing their program." "The services of ACC helped our family find the perfect fit for Jillian's athletic and academic wishes. We trusted Rick to help us find the best choices and we succeeded. Jillian was offered scholarships from over 40 universities and was recently voted Top Freshman athlete at the Division I university she eventually enrolled with. Matching the "right" swimming and academic program was not easy but ACC and Rick guided us through the whole process in a totally professional manner." ACC is with you for EVERY STEP of the recruiting process! 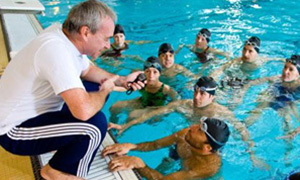 As a NCAA Division 1 swimming coach for 30 years and a club coach for nine years, I can appreciate all of the issues involved with recruiting and making the best choice for your collegiate education and athletic experience. I have known some of the staff at American College Connection for over 20 years. As former coaches themselves, they understand all of the nuances in negotiating the entire recruiting process, from academics to athletics. I am pleased to give them my highest professional and personal recommendation.